“Hello this is Romel calling to report that we had a great success on Antisana. We summited at about 8 am in perfect weather and ideal climbing conditions on the glacier. “After a day off on Thursday, on Friday we had another easy day and drove to our basecamp for Antisana. We got there at about noon and had lunch and had dinner at 6 pm. We got up at 10 pm, drove about an hour to the base of the mountain, and we started climbing at midnight. “Hey this is Brian happy to report that we had a great climb and enjoyed summiting Antisana. It was an excellent climb. The lower glacier was bare ice, then we had a couple of hours of steepening snow. “Well up the mountain we encountered a series of steep steps which our guides belayed us on. It was good climbing. The snow was good and hard, and the cramponing was excellent. Above the steep sections we had more moderate snow climbing on the way to the summit. “It was perfectly clear and we saw all the major peaks, plus several lesser volcanoes that were smoldering and had good plumes. One was Tungarahua. And we got good views of Chimborazo. It was way in the distance but you can tell it’s huge. “We spent about 20 minutes on top. It was nice there, but the sun was warming the snow up and we wanted to get down before if was real soft. “We’re spending the night in Quito and looking forward to another good meal at one of the restaurants on our list to visit. Eric is leaving, so we want to celebrate together what we’ve accomplished and have a few cervesas. "We've had two successful climbs since we last communicated. Yesterday we climbed Illiniza Norte and today we climbed the high and steeper Illiniza Sur. Norte was an enjoyable rock scramble and Illiniza South is snow and ice. Conditions were good on Sur,and we were on hard snow most of the time. We really had perfect climbing conidtions. "We woke up at 2 am and started climbing at 3 am. I think we made the summit at 6:30 or something close to that. We had some fog, but basically the weather was good. "Now we're at the lodge La Estacion and we're eating well and relaxing. Tomorrow we'll have a day for recuperation. We'll visit the big regional market Saquisili and do a little walking, but basically have a day off. Then Friday we will head into the Antisana area and establish a basecamp for that climb. It should be good and we're all looking forward to it." Romel and the climbing team called in each day over the weekend with the following reports on their trip. “I just got in last night, and being here in Ecuador has been wonderful so far. Today we went to the equator, had cuy for lunch, and explored Quito. Cuy is guinea pig, and it’s a traditional food here. It was pretty good. It had what I would call a gamey taste – very flavorful. It’s rather bony, so you have to pick at it a bit and earn your lunch. “There has been a lot to do and see here. It’s Carnival week, so there is a lot going on everywhere. There are many people out in the day and evening, an air of excitement, and a lot of nightlife. There’s also a tradition of people spraying each other with silly string, but so far we’ve held off on buying any. On Sunday February 15, Romel and Eric Milne called in with the following dispatch. Eric had the following to report. “We had a fine, mostly sunny day today. We left town at 8:00 am this morning and got back at about 4:30 pm. It was a great day and we made a successful hike up Pasachoa. It was a beautiful acclimatization hike. Lower down it was clear, but there were some clouds blowing over the top – so it was very dramatic and the breeze made it really comfortable for hiking. There was a nice scramble up high, and we enjoyed making to two tops of the peak. “We saw only a couple of other groups all day. One came part way up the mountain on horseback and then climbed the final half-mile, and the other was doing some top roping below the summit. Besides those people, we also saw a condor and a number of llamas. On Monday February 16, Romel and Jens Midthun called in with the following dispatch. Jens had the following to report. 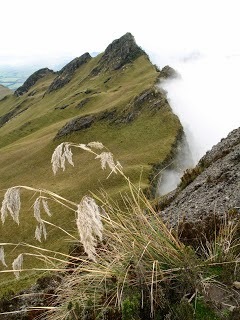 “We had a very nice climb of Rucu Pichincha today. The weather was perfect and we got to see all the big peaks. “We left the hotel a little after 8 am, and there was no traffic at all, so we got to the base of the tram at about 8:30. We took the ten-minute ride up and then started hiking in beautiful sunny conditions. 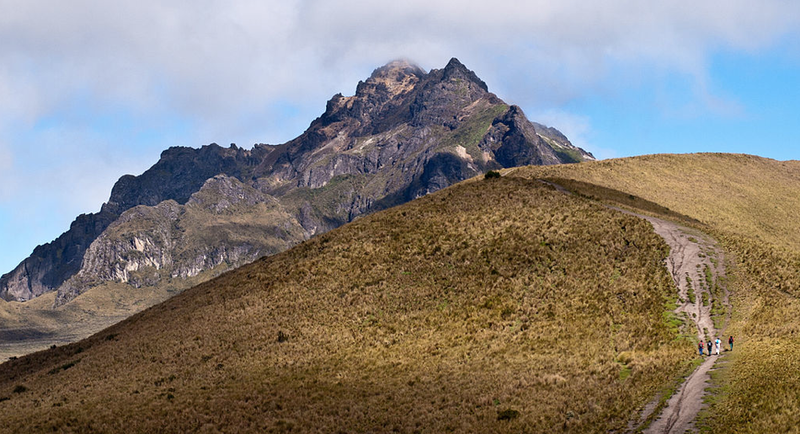 “As we climbed higher, we gained views of all of Ecuador’s major peaks. Cayambe to the north east, and turning gradually more east and then south we saw Antisana, Cotopaxi, Illiniza Norte and Illiniza Sur, and finally Chimborazo in the distance. Some were popping out of the clouds and were quite beautiful. “We left the tram at the top around 9 am and had easy walking with lots of views across open grass lands. We hike about two-and-a-half hours and then put our trekking poles away as we began to scramble the upper part of the mountain. The scrambling was fun – a little more of it on Rucu than on Pasachoa but it’s not as steep on Rucu. The peak also has a long summit ridge, and we enjoyed walking along that for about 15 minutes. We’ve also been liking the food, especially Romel’s tuna salad sandwich.